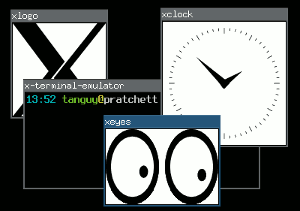 They are the most usual window managers, that allow you to place an size your windows freely on the screen, in a way where they are independent of each other, possibly overlapping, just as you would be able to place sheets of paper on your desk. They are a more elitist type of window manager, that adjust the size and position of the windows so there is no overlapping and no space lost between windows, thus tiling the screen. The frontier between these two types is not very tight, because some floating window managers have limited tiling features, and almost all the tiling window manager have floating modes for programs that are not adapted to tiling. For what it is worth, here is a report on my experience with three tiling window managers. 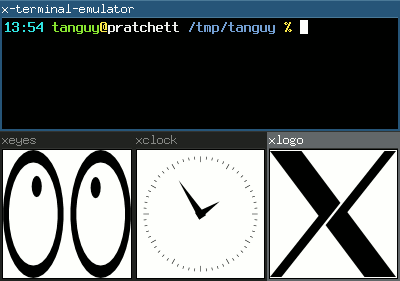 Perhaps it may help people that are still hesitating to switch to tiling window management? La récente adoption du brevet unitaire européen est l'occasion de réfléchir au système de brevets, qui mériterait à mon avis une réforme pour mieux atteindre son but. J'ai sauvé un chaton et soutenu les libertés en achetant le Pack Liberté de l'April, Framasoft et la Quadrature du Net. A number of people are using small mobile devices to read Web pages. These devices have small screens, which make it hard to read pages designed for a large screen width.